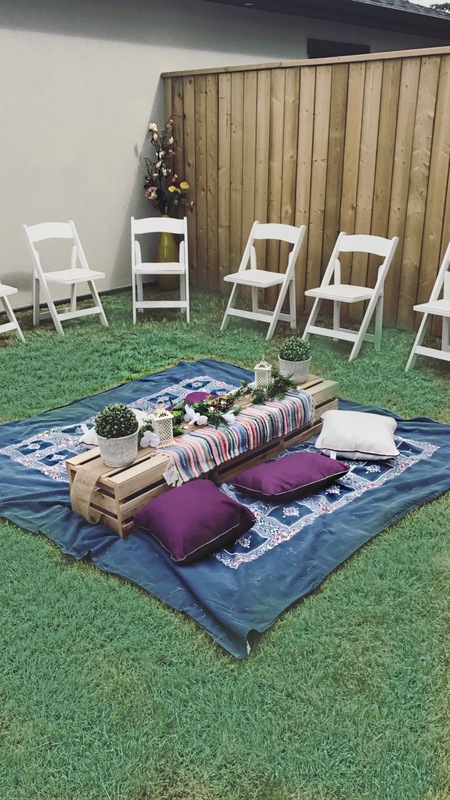 You must have a boho chic party in your backyard this summer. It is the perfect theme for a bridal shower or a birthday. The best part is you don't have to break the bank to host it. It all started because I wanted to throw my sister a surprise party for her birthday and host it in our backyard. The only problem was I didn't have any patio furniture yet and I didn't want to rush to buy it just for the sake of the party. Kunal and I are taking our time furnishing our place just how we like it. So, after perusing Pinterest for party ideas I came across the boho chic theme and I just ran with it. I saw a bunch of inspiration pictures with a picnic type spread on the ground - no patio furniture necessary.